Product #60569 | SKU 2-806 | 0.0 (no ratings yet) Thanks for your rating! 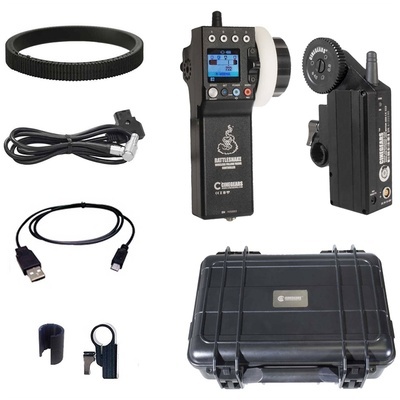 The Cinegears Rattlesnake Basic Kit with Extreme Motor allows you to accurately control focus, iris, and zoom from up to 650 ft away, and provides up to 20 hours of operational runtime per charge. The kit includes the Rattlesnake controller, Extreme motor with a 0.8 MOD and torque of 1.7 Nm, all the accessories required for attaching and connecting the motor, and a waterproof carry case. The Extreme motor attaches to your rig via a supplied 15mm/19mm single rod clamp bracket. It can be mounted on either side of the rig and can be tightened at the desired height. The motor also offers a remote record start/stop trigger port for ARRI, Sony, Canon, and Blackmagic cameras. The Rattlesnake controller features a large focus wheel that provides for comfortable and more precise control. It also lets you set adjustable speeds and up to four focal points on a built-in LCD, and it vibrates as you approach a focal point. The controller also comes with two magnetic marking discs. The included motor power cable has a right-angle connector that helps you keep your wiring neat.